Preheat oven to 180C and place rack in the center of the oven. Grease & line a 9 x 5 x 3 inch (23 x 13 x 8 cm) loaf pan or use paper cupcake cases. Grate the courgette, using a medium sized grater. Set aside. In a large bowl whisk together the flour, cocoa powder, baking soda, baking powder, salt, and chilli flakes/cinnamon (if using). Then fold in the chocolate chips. In another large bowl whisk the eggs. Then add the oil, sugars, and vanilla extract and whisk until well blended (can use an electric hand mixer or a stand mixer). Fold in the grated courgette. Then fold into the flour mixture, stirring just until combined. Scrape the batter into the prepared pan/ cupcake cases and bake until the cake has risen and a toothpick inserted in the center comes out clean, about 55 to 65 minutes for a loaf / 15-20 minutes for cupcakes. Place on a wire rack to cool for about 10 minutes, then remove the cake from the pan and cool completely. This cake can be stored in the fridge (if frosted) or at room temperature for several days, or it can be frozen. – Follow directions on the icing sugar box for ‘Buttercream frosting’, just replace 1/4 – 1/3 of the icing sugar with cocoa powder. 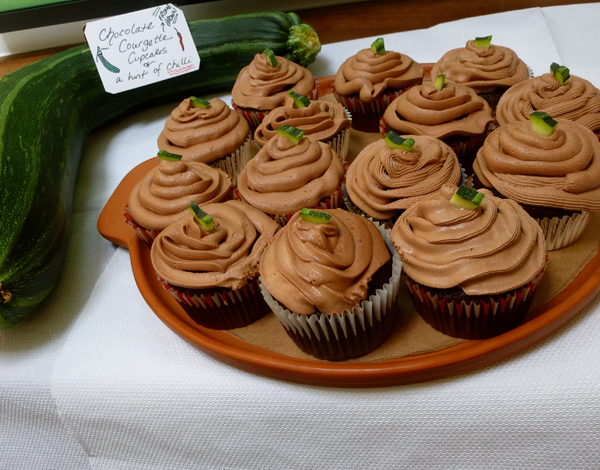 There you have it…hope you enjoy these tasty courgette dishes. And last but not least, we’d love to see your favourite recipes too. So please do send them in and we’ll share them with other Allotment Holders via Twitter or here on the Blog. GERRY, who is an allotment rep at the Muriel Jones Field (Birchill Lane) slid this recipe under the door of my shed. Lentils are quite floury in texture and can be used to make a mixture that is thick enough to be used as an alternative to pastry. 1. Preheat the oven to Gas Mark 5/375oF/180oC. 2. Cook the lentils in twice their volume of water for about 15 minutes, or until they are fairly soft. Beat well with a spoon, then drain excess liquid if any remains. 3. Heat the oil in a pan and gently fry the onion for 3-4 minutes or until soft. Add the garlic and fry for 2 minutes. 4. Remove from the heat and mix in the cooked lentils, tomato purée, oats, lemon juice and herbs. Season well. The mixture should be thick enough to hold together. If the lentils are a little wet, return the pan to the heat to dry them out before adding or add a few more oat flakes. 5. Press the mixture into the base and up the sides of an 20cm/8″ flan dish. It is easier to do this with your hands than with a spoon. 6. For the filling, lightly steam the courgettes for 4 minutes or until tender. 7. Blend the eggs with the flour, then add the milk. Stir in the cooked courgettes and season well. 9. Bake for 25-30 minutes or until the filling has set. 10. Serve hot with jacket potatoes and salad. Note: Adapted from “Sainsbury’s Healthy Eating Cookbooks: Beans, Nuts & Lentils” by the vegetarian food writer Sarah Brown.